Follow the arrow! Over Under Coffee in Earls Court. Whenever I’m heading somewhere that I haven’t been to for a while, I check the London’s Best Coffee app to see if any new cafés have popped up in the area since my last visit. So when I was in Earls Court recently, I was very happy to be alerted to a new café on the map with a review by Beanthereat. Over Under Coffee is at 181A Earls Court Road but is tucked around the corner from the main road and so thank goodness for the helpful arrow (and the map which told me I should be on top of it). Once found, we ordered coffee and banana bread and took a table to sit down. The friendly staff behind the counter were quite confident of the ingredients in the banana bread as it is made locally by a lady in Fulham (whose name I have sadly forgotten). The coffee and banana bread formed a great combination for a mid-morning snack. 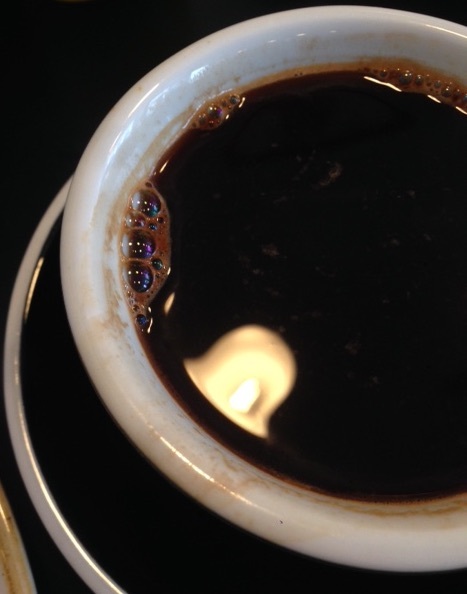 Coffee is roasted by Assembly roasters over in Brixton and came with lovely interference patterns in the bubbles on the surface together with dancing white mists, which never fail to fascinate me. On the table next to ours was a small Kilner jar for sugar and two succulent plants. The Kilner reminded me of the use of air valves in coffee packaging (which are non-recyclable plastic) and the interesting experiment by Roasting House coffee roasters to investigate whether they are actually needed for freshly roasted coffee (which you can read about here). 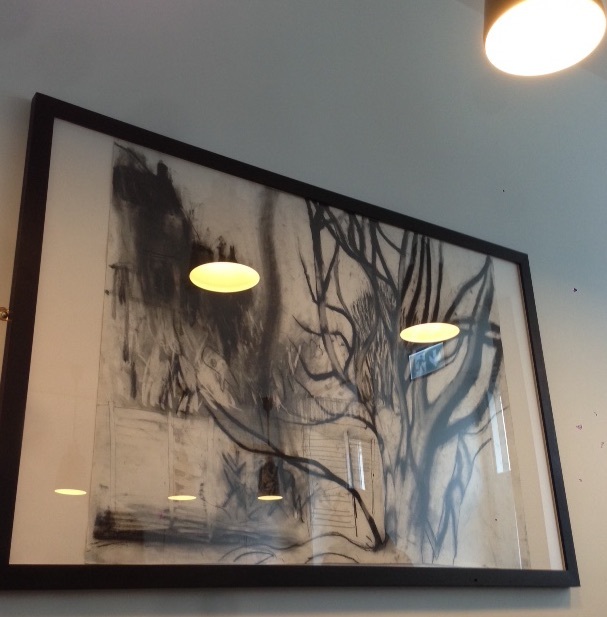 However it was a picture above the table that prompted the thought-train for today’s Daily Grind. A charcoal sketch, the picture featured a tree in the foreground with a fence behind it. From a very early age we are taught how to represent 3D objects on a 2D sheet of paper, the idea of perspective seems ingrained on our minds. But how intuitive is it really? A picture at Over Under. Note the smaller reflections of the (more distant) light fittings. Although the ancient Greek artists could convey an idea of depth in their art, the development of a mathematical understanding of perspective only came with Filippo Brunelleschi (1377-1446), although a written account of the mathematics of perspective did not arrive until Leon Battista Alberti (1404-1472). Alberti’s method for drawing in perspective used not just a vanishing point, but an additional diagonal vanishing point in order to construct a sense of depth and an accurate depiction of perspective (a description of Alberti’s method is here). The development of the understanding of perspective during the Renaissance meant that for some paintings, the ‘viewing depth’ can actually be calculated, while other artworks managed to create optical illusions whereby objects would jump out at the viewer as if they are in 3D. Works such as Andrea Pozzo’s ceiling in the chiesa di Sant’Ignazio in which a flat ceiling appears magnificently domed. Or, closer to home, Samuel van Hoogstraten’s work in the National Gallery in London in which the viewer looks through a peep hole to see the interior of a house complete with a dog that appears to be sitting up inside the painting. Such paintings required a knowledge of the mathematical rules behind the depiction of perspective. Isn’t it surprising that the understanding of these rules is so recent? Another art work with an interesting use of perspective that will bring us, in some way, back to Over Under Coffee is Raphael’s fresco “School of Athens“. The two figures of Plato and Aristotle stand at the centre of a diverse group of philosophers including Socrates, Zoroaster, Euclid, Diogenes the Cynic and, possibly, an image of Hypatia of Alexandria. Although the use of perspective for the architecture draws your eye towards the centre of the picture, two spheres (held by Zoroaster and Ptolemy) on the right hand side of the picture are drawn as circles rather than ellipses. Spheres viewed from an angle should be represented as ellipses if drawn correctly according to the rules of perspective. Did Raphael make an error in perspective (that may work better for our eyes?) or is the degree to which these two spheres are distorted within the limits of the fresco brush and so not visible in the picture? An episode of Radio 4’s In Our Time discusses this picture at length including a deep conversation about the significance of Plato pointing upwards towards the heavens and Aristotle indicating towards the Earth. Plato’s wisdom and Aristotle’s knowledge, above and below, much like the weave logo that brings us back to Over Under Coffee. 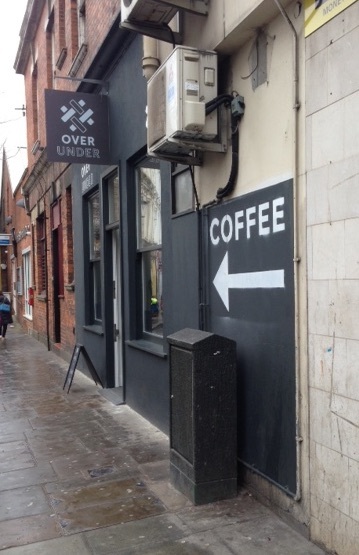 Over Under Coffee can be found at 181A Earls Court Road, SW5 9RB.